A beautiful natural region with lovely views, swimming, and boating opportunities. The Gorges de l'Ardèche, formed by the Ardèche River, run between the small town of Vallon Pont d'Arc and St-Martin d'Ardèche. A winding road 32 kilometers/20 miles long passes through this beautiful area, much of which is protected as part of the Réserve Naturelle Gorges de l'Ardèche. The area is full of cave and canyons, with dramatic views all along the way. Allow a couple of hours to drive along the road, stopping at some of the ten or so parking areas/turnouts to enjoy the dramatic views. Cliffs rise to 300 meters (984 feet) above the river as it twists and turns through the canyons. If you have the time and the inclination, bring your swimsuit and towel, as there are several places where you can take a dip in the Ardèche. It's also possible to rent canoes or kayaks in Vallon Pont d'Arc and ride a ways down the river. Options range from an hour and a half trip, with few rapids, to a two-day, 32 kilometer trip with bivouac camping or other lodging. Overnights must be booked in advance. Any boating trip will pass under the actual Pont d'Arc, a natural bridge just a few kilometers south of Vallon-Pont-d'Arc. Even if you're not boating, there is a parking area nearby and you can walk down to the beach and see the Pont d'Arc. It is also visible from the road, but much more fun to see from the edge of the river. There are beaches on either side of the Pont d'Arc and it's a great place to enjoy a swim and watch the kayakers and canoers go by. If you like hiking, there are also a variety of walking trails in the reserve. 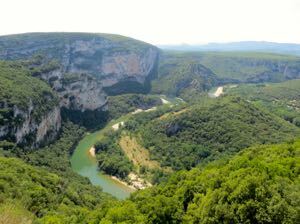 A visit to the Gorges de l'Ardèche can be combined with a visit to the Caverne du Pont d'Arc. It makes a great day trip from Orange. 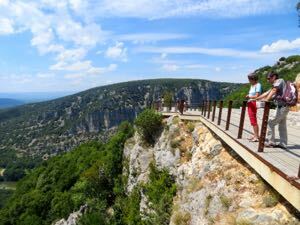 Above, Looking down on the beautiful Gorges de l'Ardèche. Below, One of the overlooks along the road.